In the wake of acquisition rumors that WhatsApp refuted, Facebook is chugging along with its own Messenger service. Soon, you’ll no longer need a Facebook account to use the app, but can instead sign up with your name and phone number – provided you have an Android phone. At least initially, this update will only be available for Android, and it’s available immediately to a select number of countries including Australia, India, Indonesia, South Africa, and Venezuela. It will be rolled out to other countries shortly. Mobile phone owners now might find the platform more attractive to use for messaging friends and family since it no longer forces users to connect with their Facebook accounts. But like other messaging apps, the app requires users to sign up with their phone numbers in addition to their names so that Facebook is able to pull the contact information from the native contact list on your smartphone. It helps to sync your contact list to find out whether someone else is using the app already. If you send a message to someone that doesn’t have Facebook Messenger downloaded or isn’t logged into Facebook, Facebook will notify the recipients to download Messenger. The social network isn’t holding back either. Its aggressive uncharacteristic strategy is evidence to the Facebook’s vested interest and willingness to invest in Messenger at whatever the cost may be. With competing messaging apps in the market that boast tens of millions to an upwards of hundreds of millions of users, Facebook’s time to capitalize on its users and platform really is right now. There’s a lot of busy to be had with third party messaging systems, and Facebook is looking to capitalize while the time is right and before the competition gets any thicker. There’s a good chance that friends or family are already on Facebook, meaning that there’s a good chance that they have Facebook Messenger on their mobile devices already. That alone lessens the burden of convincing users to adopt Messenger. 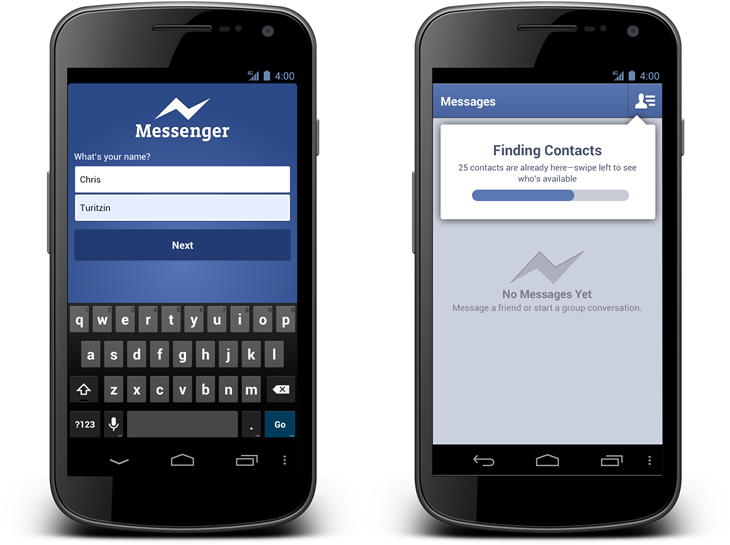 But ultimately it’s the rebranding of Facebook’s messaging app that’s going to be critical to Messenger’s success. Facebook wants users to think of the app as an SMS alternative, but until today Messenger was a messaging platform like AIM and Google Chat that happened to be optimized for a mobile device. It doesn’t help that Facebook Messenger is in reality one package posing as three different products. The mobile messaging app is to become an SMS app, its messaging feature on the Web app was branded as an email client, while the chat column you find on the right side of your profile page is an in-app chatting product. This update to the iOS app is in the works, but no details have been released about the release.